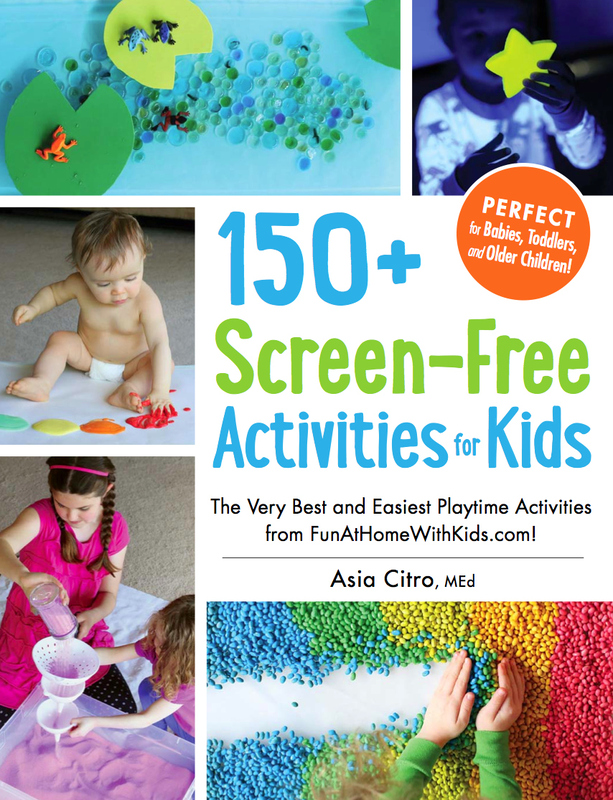 Today I wanted to share one of my favorite recipes from our new book, 150+ Screen-Free Activities for Kids. 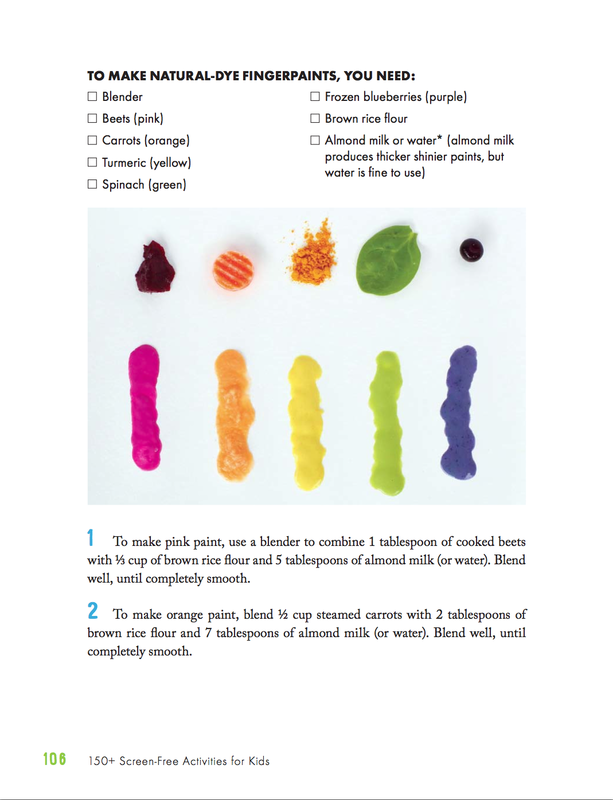 Those of you who already own the book can just flip to page 105. :) For those of you who don't have the book or aren't familiar with it, it's got a whole line of naturally dyed sensory recipes (natural dye playdoughs, rice, paints, watercolors, etc.). 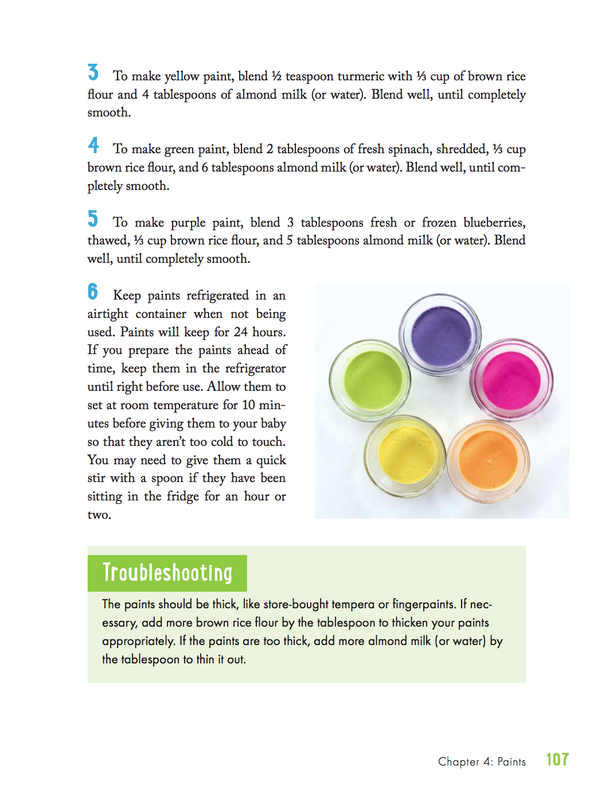 It also focuses on allergen-free recipes and this recipe is free of all of the most common allergens, which makes it a perfect first paint for babies and young toddlers. 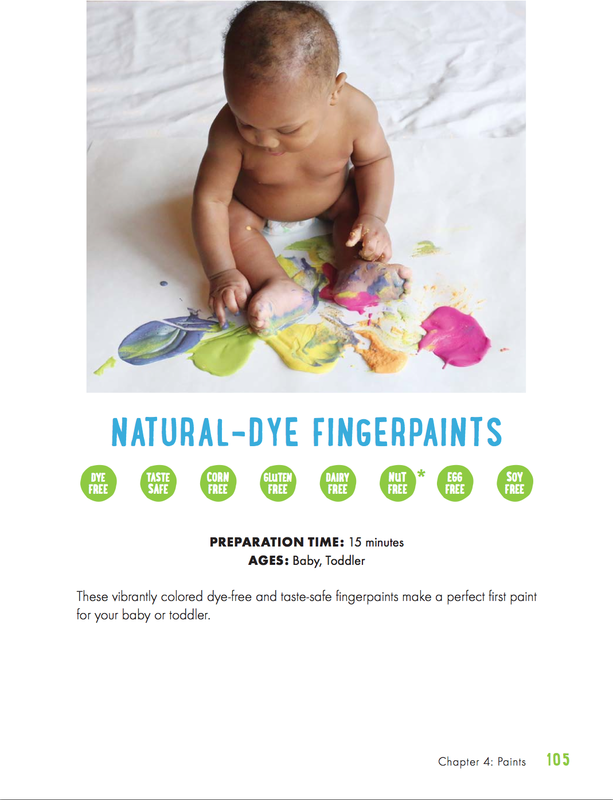 The book also has 72 activities for babies, so if you've got a little one you'll be able to find tons of new ideas for play. When I wrote the book, I wanted to include all of our best recipes. Half of the book is new, but of the half that has recipes from the blog - nearly all of them have been reworked to be better and clearer. This recipe is an example of one that's been reworked - it originally appeared on the blog almost 2 years ago here. But I worked to make the consistency more paint-like and the colors brighter and bolder. I'm really proud of how they turned out! Here are the directions, directly from the book. Please note that these pages are reproduced with permission, and that these directions may NOT be copied onto another blog or website or otherwise reproduced. (it's received over 130 five star reviews) here are some places you can find it! This is a wonderful idea! My one year old always wants to do what the big kids are doing so I will definitely be trying this for her. How fun! How does this do as a long-term display art? Does it start to stink/mold after a few weeks? I can't swear to it...BUT...most times mold & decomp are related to moisture, so if the picture were small enough I would try sticking it in my food dehydrator. It has worked for us on things like the leaves my kids collected & wanted to glue onto paper for gramma. I knew they would be nasty fast if left as is & desiccation them takes time...so, they weren't perfect, but they also didn't shrivel or become weird & brittle. You can also try dessication if you don't own a dehydrator. Just put it in a plastic tub, cover with clay litter (make sure it is dry enough not to stick first) and then check it occasionally & stir litter around. It pulls out all moisture pretty quick. For the pictures i want to keep, I actually just stick real close by & give them large paint brushes (think house painting) and real acrylics on canvas. I think it is worth the money as I love to hold onto a few baby paintings from each child. So far, I've never had anyone attempt to eat anything I couldn't catch in time. Does it stain their hands or come off easily with soap and water? We've never had issues with it staining skin - it's always washed right off. Thanks for sharing we will have to try this my boys will love it! I have been trying to find something like this for years! Dyes cause some real problems here so this is really special. Does it have to be brown rice flour, or will white work as well? Great-thanks! Can't wait to get your book once it's back in stock on Amazon! Do you have this book in spanish? Im from Mexico and i want can play whit my baby whit your book! 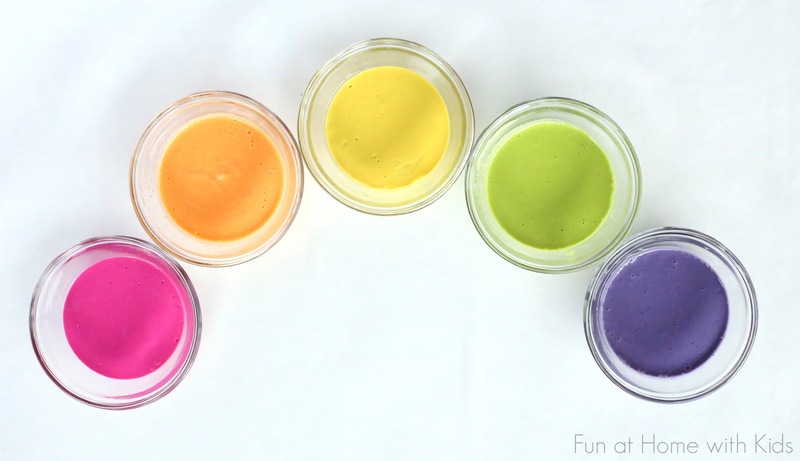 I would suggest if you want to save something the kids painted with this, use modge podge over it when it's dry. That would seal out any moisture and oxygen that could cause mold. Sounds like it could work to me! What's modge podge? Is it like hair spray?? It's a glossy coat you can paint on crafts - you can find it at Michaels or another craft store. You can also use white or clear school glue mixed with a little water to seal the paintings if Modge podge isn't available in your area. Ddo make sure ahead of time that the white school glue dries clear as most do, but you never know. Does it have to be rice flour? Thanks! Would it be okay to use the photos of your finished products (not the pages from the book) if I link back to this page? They turned out beautifully and I would eventually love to share them on my blog! YAY have been looking for some safe homemade paint thank you! 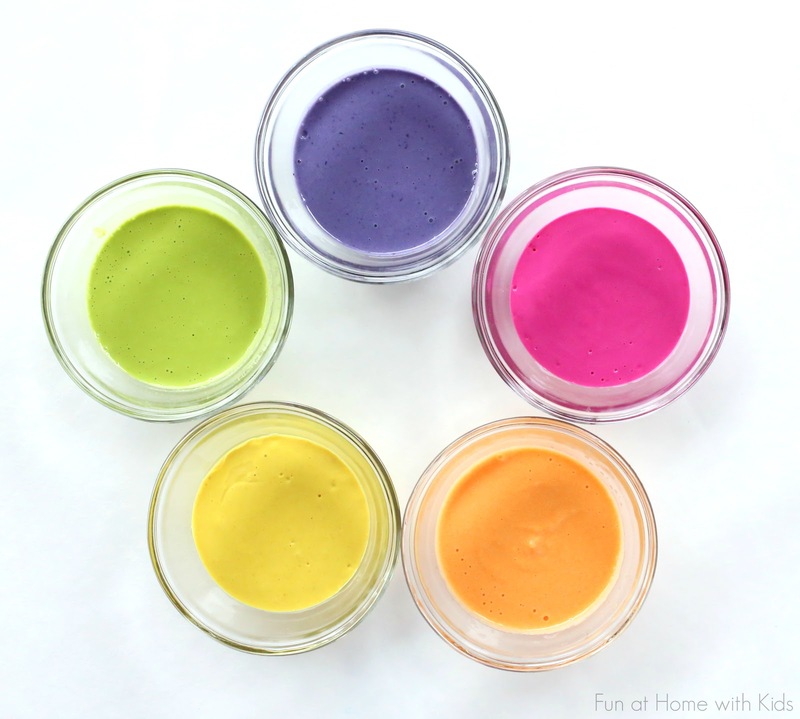 My kids love playing with paint and this will be handy. So clever. I looked you up because I just got your book as a gift. My first thought was, "Oh I probably won't be into this." Then I opened it and my second thought was, "Wow. Those kids live in a FUN house!" A few pages in I was dog-earing pages and thinking, "Oh I can't wait to try this! The kids (and I) will LOVE it!" Thank you so much! What a gift! Then I saw that you are also a Seattle Blogger. Love it! I'm just across the way blogging from my home on Vashon. Much love and thanks again! Hi Asia, can I keep them in fridge for aweek? You could try, but I'm fairly sure they would mold. If you need to make them ahead of time, I'd try freezing them and then thawing them and adding a bit of water. Hope that helps! I absolutely love this idea my son is 6 months old and is quite advanced a little for his ago. He would go insane!! So much fun! !